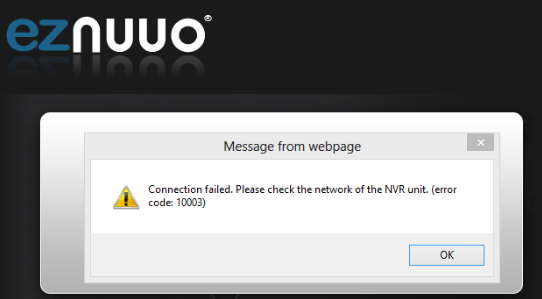 When logging in a NVRsolo at www.eznuuo.com, the error message pops up: "Connection failed. Please check the network of the NVR unit. (error code: 10003)"
在 www.eznuuo.com 中登錄 NVRsolo 時, 會彈出錯誤訊息: "連接失敗。請檢查 NVR 的網路。(錯誤代碼: 10003) "
The NVRSolo is offline. P2P Server could not discovery it. Please make sure the NVR is connected with the internet. Please login web interface of the NVR, go to "Network Setup" > ezNUUO Registration, and click on "Test." If "The server ID is available" shows up, it it confirmed that the NVR is connected with the internet.